The first hint of a fancy dress party sends him speeding up the stairs and rummaging through his fancy dress box deciding what he is going to go dressed as this time. In fact there doesn't even need to party! You will often find us wandering around the supermarket or our local park with James dressed as Batman or a Dragon lol! So when James was given the opportunity to choose a fancy dress outfit of his choice from Fun Warehouse I knew he would be beyond excited and it took him several days to choose as there is just so much choice. He eventually settled on a Hulk Deluxe costume as despite having almost all the Marvel and superhero costumes this was one he was missing. The Hulk Deluxe costume came well packaged in a reusable plastic pouch with a popper fastening to the top so if you wanted to you could easily use this to store the outfit when not in use. The fancy dress costume is made up of 2 items the all in one outfit and a hard plastic mask with an elasticated fastening to the back. 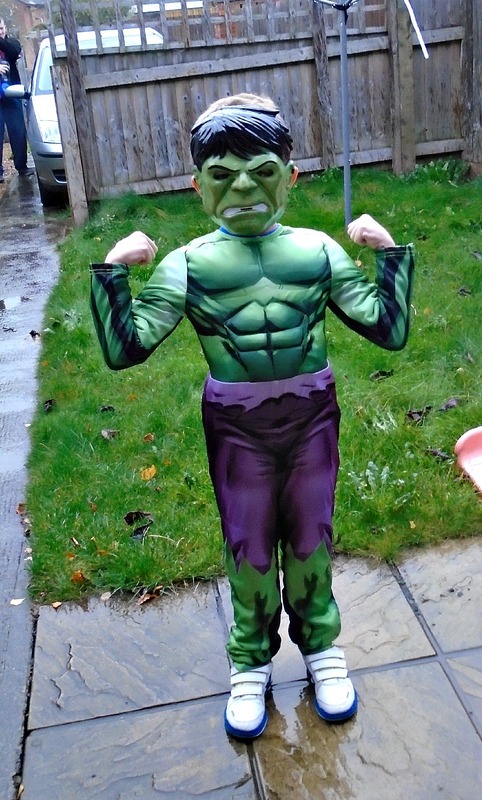 The Hulk Deluxe costume is available in sizes 3-4 (small), 5-6 (medium), 7-8 (large). James is 6 but is quite tall for his age so I ordered the 7-8 and it was a perfect fit, if in doubt about size I would definitely recommend ordering the larger size. James was very impressed by his Deluxe Hulk costume and loved the added touch of the padding "muscles" which makes this costume the "deluxe" version over the standard version. The costume feels well made and the velcro fastening to the back of the main costume feels pretty hard wearing. James has now worn the costume on several occasions and it still looks as new, the velcro is still holding strong and isn't showing any signs or pulling away or loosing its "stick" which I often find happens in cheaper costumes. The colours are still vibrant and bright too after several washes and the padding is most definitely holding its shape. 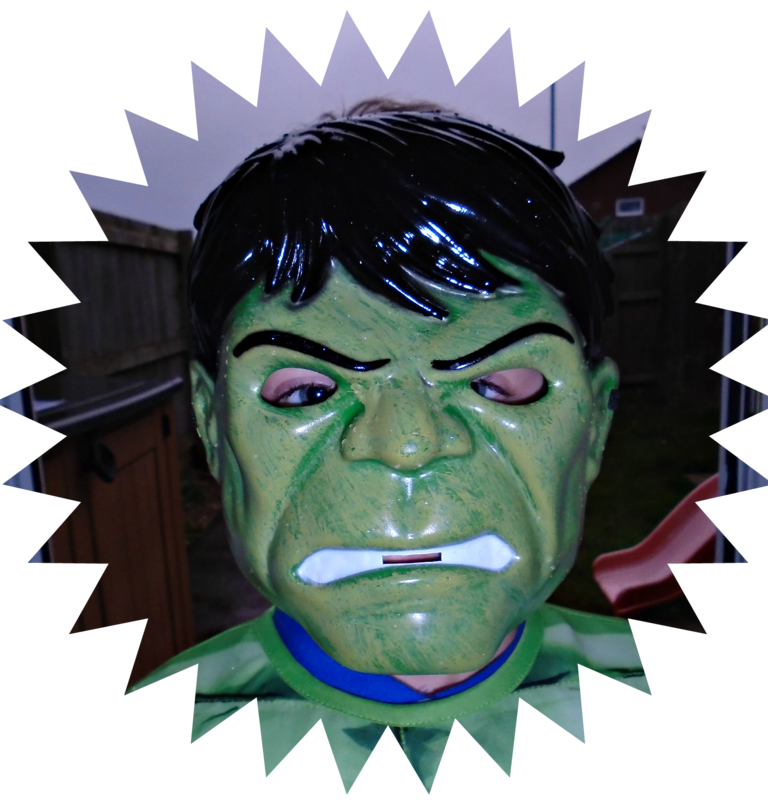 The mask the costume comes with is a great quality too, made from a hardened plastic rather than your usual flimsy plastic means the mask is certainly made to last through hours of play! The Hulk Deluxe costume is priced at £22.84. Overall we love the Deluxe Hulk costume and the great service we have received from the Fun Warehouse. If you are looking for a fancy dress costume you must check them out! They have something for every occasion from Superheros like the one James choose to Christmas and Animals. Fun Warehouse don't just sell children's costumes either they sell a whole range of adults costumes too. Why not check out all the costumes over at the Fun Warehouse website. Do you or your children like to dress up? Whats yours or your child's favourite character to dress up as?